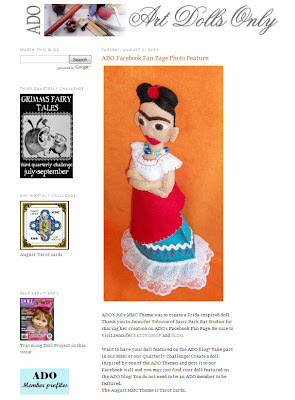 The Sassy Pack Rat: My Frida Doll is Featured on ADO's Blog! This is a secret I've been keeping since I found out about it last week. The Frida doll that I made for the Art Doll Only July Mini Challenge is featured today on Art Dolls Only blog! Squee! I recently noticed that they were allowing non-members to join in their challenges. I made the Queen of Hearts for their Wonderland blog challenge. I've been following this blog and many great ADO artists for a while now so I'm super excited that they choose to show my Frida doll! If you remember from my original post about this doll, I only did it because I was bedridden for a few days and needed something to occupy my mind and decided to try this one. So, so glad I did! Here's the link to their blog. Art Dolls Only Blog. Yay, you're a star! I love your Frida!